Connor just arrived from the Birmingham Race track. She is a tiny black female that only weighs 55lbs. She turned 2 on May 5th and only raced 39 races. She was pretty good and quickly got up to the top A level of racing there and won a couple A level races. She pulled up in her last race August 2nd and they found she had a broken front leg. Her leg was fixed and splinted at the track. She is out of the splint and cleared for adoption now. The break healed up very well and shouldn't affect her life as a pet. Connor is a shy girl at first with people she doesn't know but it usually only takes her a few days to warm up to new people. She is very sweet and loving with her foster mom and the staff at the vet clinic that she has visited frequently. She was a little interested in the cat at first in her cat test, but once the cat slapped her she wouldn't get near it again. She has done well in her foster home with the cat there too so should do well in a home with a cat. Most of our shy dogs are a little too timid to live with loud, rowdy, young children and prefer more quiet homes with older or calm, quiet children or children that just visit occasionally but Connor hasn't really been around many children yet. Connor is a very sweet, happy girl that is so beautiful! 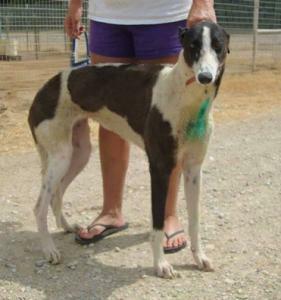 Andrea just arrived from a greyhound farm in Kansas with her sister Abby. She raced 162 races at 57lbs in Palm Beach Florida. She retired from racing in January of 2014. Andrea has been at the farm since, with the plans for her to have puppies. Her owner decided to retire her and let her be a pet so she is ready for the pet stage of her life now. We already placed her mom Audacious and one of her sisters Beguiled so have been waiting on her and her sister to retire. Her sire is TK Quick Strike. Both girls passed their cat tests so should be fine to live in a home with cats or small dogs. We found out that Andrea is a grinner when she is happy. Very cute! More as we get to know her. Bo never raced. He was born on November 4th in 2005. Bo has had a long run of bad luck with adoptive homes. He was adopted out as a young dog and was in his first home for 4 years until 2011 when one of them started having trouble with a dog allergy. He was adopted out to another family in 2011 but was found running loose in April of 2014. His previous family didn't respond to attempts to contact them to see if they wanted their dog back so the family that found him decided to keep him. Bo has been whining a lot in that home and didn't appear to be happy, so now he is being rehomed again. His sire is the famous Fortified Power and his dam is M's Elizabeth. 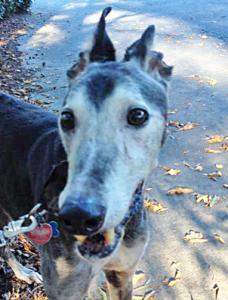 He just turned 9 on Nov 4th so qualifies for our reduced adoption fee of $200! Bo is a handsome boy that loves to be by your side. Bo absolutely loves children and slept in the bed with a 7 year old boy in one of his previous homes. He gets along well with other dogs small and large. 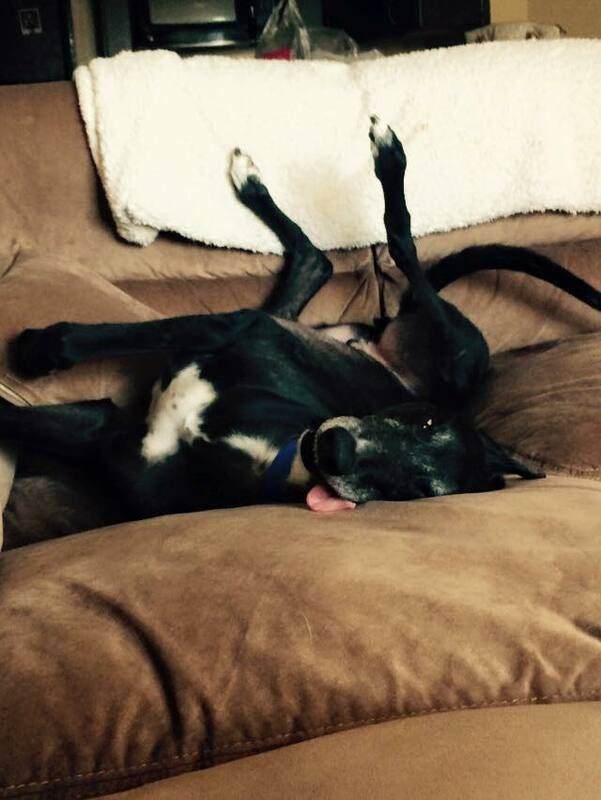 Bo is a fun boy, and is constantly making his foster family laugh. Even though he is an older guy, he is still playful and loves to run around in the yard. After a very short run can usually be found laying on the couch or bed nearest his people. He is such a loving happy guy and so cute too! Bo seems like he has too high of a prey drive towards cats to be able to live with them but has been living with small dogs and is wonderful with them. 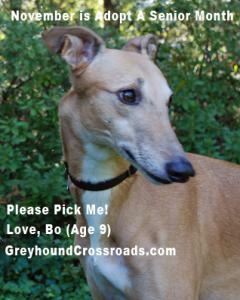 Bo can be vocal if left alone so wouldn't be a good dog for an apartment or townhouse. If you want a dog that is already used to living in a home that loves kids, this is your guy! 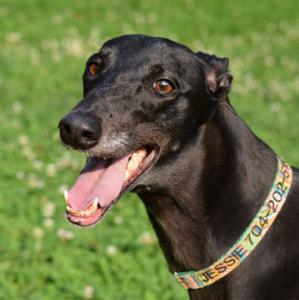 Gracie is a small black female that raced at 57lbs. She originally came from the track in Orlando and raced only 9 races there not placing in one of them. Gracie has been in an adoptive home for over 2 years already so comes home acclimated and should be a very easy girl for just about any family. She is a sweet, friendly, laid back girl. Her birthday is March 28th 2010 so she is 4. Her sire is Tony's Oracle and her dam is USS Upside. She is a littermate to Michele Henry and Cute Candle that we already placed and a half sister to several other dogs. Gracie has been living with cats for 2 years and is fine with them. She did great in her adoptive home at first as one of only a couple of dogs. In the last two years they have added quite a few dogs to the family including 3 puppies. Gracie has always had some issues with not liking to be bothered by other dogs when laying down or sleeping. Having so many dogs in the house is too much for her so her family would like us to find her another home where she will be happier. 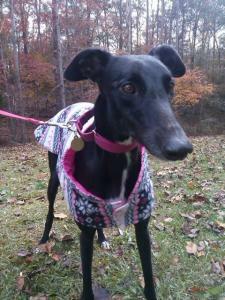 Gracie needs a quieter home with only one other calm dog or no other dogs. She is fine with people approaching her when she is laying down according to her former family and likes children. Because she has shown grumpiness about her space with other dogs we chose to mark her older children only just to be safe. 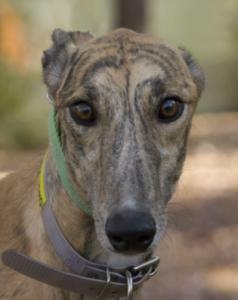 Sarah is a beautiful, unusual light fawn with black stripes. She is a tiny girl racing at just 55lbs. She was a successful racer and raced 131 races at Derby lane in St Pete FL. She even raced in a couple of Stakes races. Because she was good she had one litter of pups before she was retired. Even though she had a long race career and is a mom she is still very young and won't turn 5 until February 2nd. 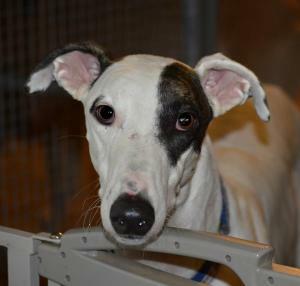 She is a very special girl with a great personality that her trainer would love to just adopt herself if she had room for another one at home. She wants this girl to get a very special home. Sarah's sire is the famous Dodgem By Design and her dam is Dreamy Blossom. More as we get to know her. Be sure to look at her other pictures to see pictures of her as a puppy. Elf never actually raced and broke her leg in training. She is very young and just turned 1 year old on April 19th. Elf had surgery to fix her leg and was transported to our group a month later after she was cleared to travel. Her sire is Kelsos Fusileer and her dam is Kiowa Adara Amy. She has made a good recovery from the break and should be able to walk and play just fine. Her splint is off and she has her final vet appointment on October 10th so is available for adoption now. To help our group take in more injured athletes like Elf please go to our Injured Athlete Page. This is a very special fund that we have just for dogs with major injures and 100 percent of it goes to pay for surgeries and vet care. Thanks to our generous supporters we are able to help quite a few dogs with broken legs. Elf is a very sweet snuggler that loves to get up in your lap. She loves people and gives puppy kisses and even grins sometimes. Elf loves kids and everyone she meets. Since she is still a playful pup, she might accidentally knock over toddlers while playing with them so we have her listed as older children only. Because she is still a pup, Elf needs supervision and frequent reminders about household rules. She has played with a Jack Russell in her foster home and is good with him, but being a pup she might play too rough to play with a tinier dog than that. 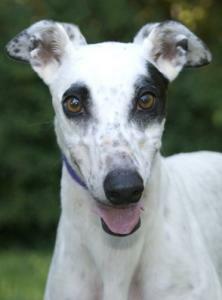 Lindy is a very young, beautiful, white girl with black spots that came to us straight from the farm. Her sire is Djays Octane and her dam is Leprechaun Girl. Lindy never showed much interest in racing so her racing owners feel that she would make a better pet and decided not to send her to the race track. She did pass her cat and small dog tests so should be fine in a home with either. Lindi is very timid and shies away from strangers. If you come to meet her she will go to her crate and won't interact but she only needs a little time to warm up. She is very friendly and comfortable around her foster dad after just a short time. Lindy just needs a little time and patience and she will be the BEST girl. Lindy has turned into a very sweet snuggler at her foster home. Very loving! Lindy came in with her sister Lori who has already been adopted so some of the pictures are of both girls. Heritage just arrived from the Birmingham Race Track where she raced 48 races. She was retired for bumping into and playing with other racers during her last race. That isn't allowed. Her sire is BD's Grayson and her dam is Flying Marietta. She is a smaller red female that raced at 57lbs. She turned 2 on the 4th of July. Heritage is grinner, when she is happy she will do the cutest big grin. Heritage did pass her cat and small dog tests at the racetrack. More as we get to know her. 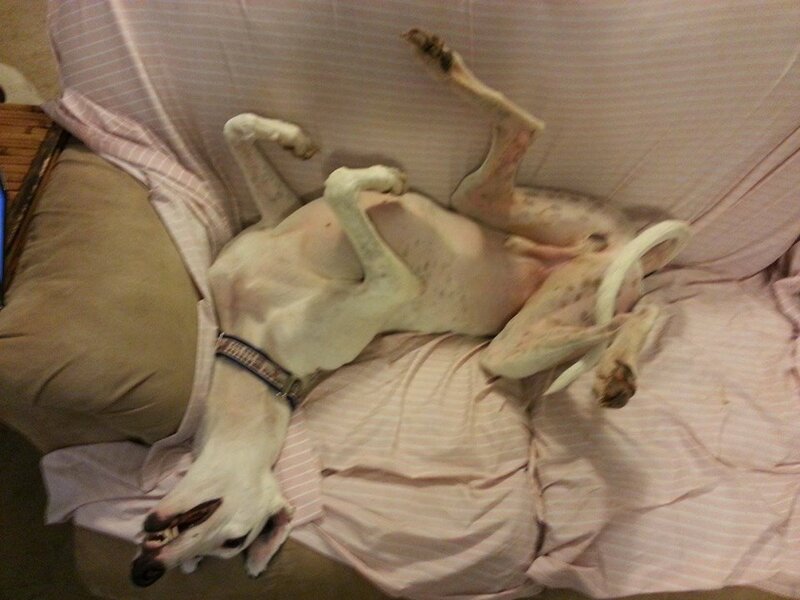 Collins originally came to us from D'Arcy Kennels at Derby Lane in Florida in August of this year. She is a daughter of the very famous Kiowa Sweet Trey and her mom is a dog that we placed Deco Caraways. We already placed her sister Vale of Arryn too. 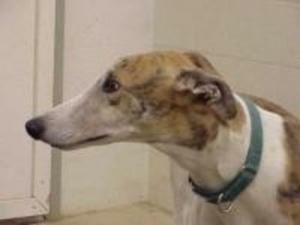 Collins raced 50 races at Derby Lane and is a young girl that celebrates her 3rd birthday on December 8th. 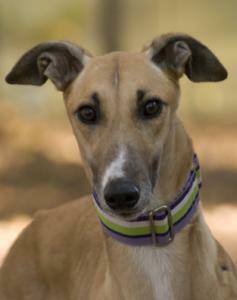 She is a bouncy happy girl that loves to play and run and does the cutest greyhound grin when she is happy. Collins passed her cat and small dog test so should be fine to live with either. She has been in an adoptive home since August but is being returned to us. 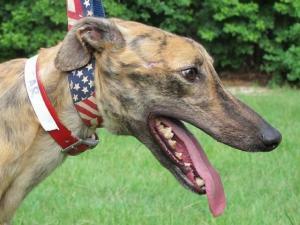 Leeza came from the Sanford Orlando race track where she raced just 16 races. She didn't win one of them. Her sire is a famous guy that actually lives in Upstate SC, Dave The Dog. Her dam is Jr B's Amy Lou. Leeza is a small girl that raced at 57lbs. She was a little timid at first but warmed up fast. She did great at a meet and greet recently with kids and adults all around her and was very friendly. 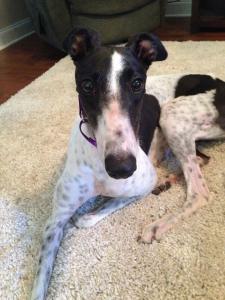 She plays with her foster mom and the male greyhound in her foster home. She is a calm, well behaved girl that turned 2 on July 26th. She passed her cat and small dog tests so should be OK to live with either. Leeza is a follower and is more confident if she has another dog to follow around so her ideal home would have at least one other dog. 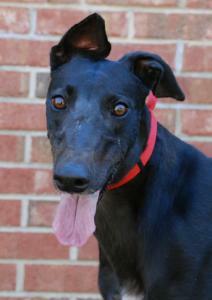 BoJack is a black male with a white face that raced at 76lbs. He just turned 8 October 30th. He raced at 4 tracks Wonderland in Mass, Tri State in WV, and Palm Beach and Jefferson County in Florida. His sire is WW Apple Jax and his dam is Flying Neely. BoJack is a sweet, friendly guy that was very well behaved at the track. He passed his cat and small dog tolerance tests at the track and lived around cats in foster care. He lived in a home for a couple of years after he retired but his owner had to move and couldn't take him. Last year he was adopted by a family with a lot of kids of all ages and he has been wonderful with all the children and the large family. But now they have to return him to us. 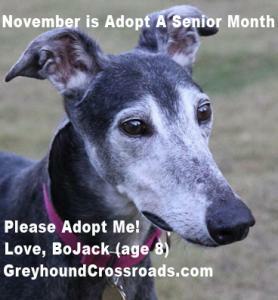 BoJack is a wonderful dog and should be comfortable in almost any home situation. He would be perfect for a home with kids. Because Bojack is 8 years old he qualifies for our senior discount! Leila just arrived from the Birmingham Race Track where she raced 31 races. She never won a race so her career was short. Her sire is Cry Homer and her dam is Humdinger Doll. Leila raced at 64lbs and just turned 2 on August 16th. She was more interested in checking out everything in the room than the cats when she met them and did fine with the small dog too. So she should be fine in a home with cats or small dogs. More as we get to know her. Yingling just arrived from the Birmingham Race Track where she raced 75 races. She actually won her last race by a neck. Her sire is the very famous Kiowa Sweet Trey and her dam is Its Quenna. Yingling will turn 3 on Dec 10th. She is a red brindle girl that raced at 63lbs. Yingling didn't pass her cat test so needs a home without kitties but she did pass her small dog test so should be fine to live in a home with small dogs with supervision at first. More as we get to know her. 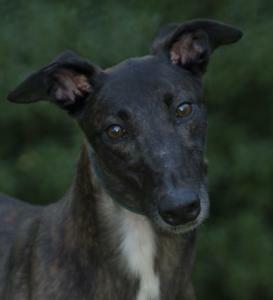 Don't let his tough name fool you, Crusher is a sweet, loving guy that looks like a deer with big dark eyes. In spite of his cuteness he has been waiting on someone to adopt him or another group to take him at the Birmingham Adoption Kennel since he retired in May. Crusher has a higher than average prey drive and at first mistook other breeds of dogs for bunnies so it didn't appear that he was going to be able to live with small dogs or cats. He is doing great in his foster home though and after sniffing a few dogs of other breeds figured out that they were just dogs. He has been fine meeting even a small white Italian greyhound. He loves to play and does try to get other dogs to play with him so he would probably do better with medium to larger dogs that could actually play with him than very small dogs that couldn't. Crusher loves toys and especially likes ones that squeak. He complains sometimes about being left in his crate so probably wouldn't be a good dog for apartment or townhouse living. 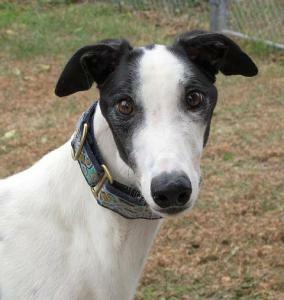 He loves people and is great with other greyhounds he has met. He was a good racer that raced 110 races in Birmingham and he got up to the highest A level of racing. He raced at 73lbs which is mid sized. Crusher turned 3 on April 24th. His sire is Mulberry Lazer and his dam is Mulberry Tipsy. 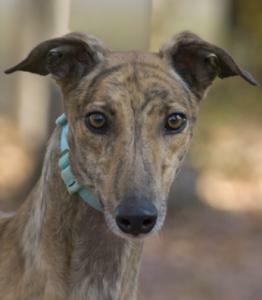 Patsy originally came to us from the Orange Park track in Jacksonville Fl. She actually raced in Sarasota Florida and in Dubuque IA though and never actually competed in Orange Park according to her race record. She is a 66lb red female that raced 40 races. Patsy turned 3 on July 25th. Her sire is from Ireland named Team Record and her dam is Pat C Fluctuate. 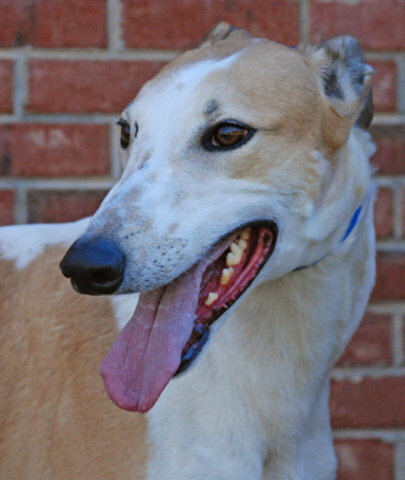 Patsy is a happy, friendly girl with a great personality. She is used to being around kids because her trainers brought their kids to work with them and she loved the kids. 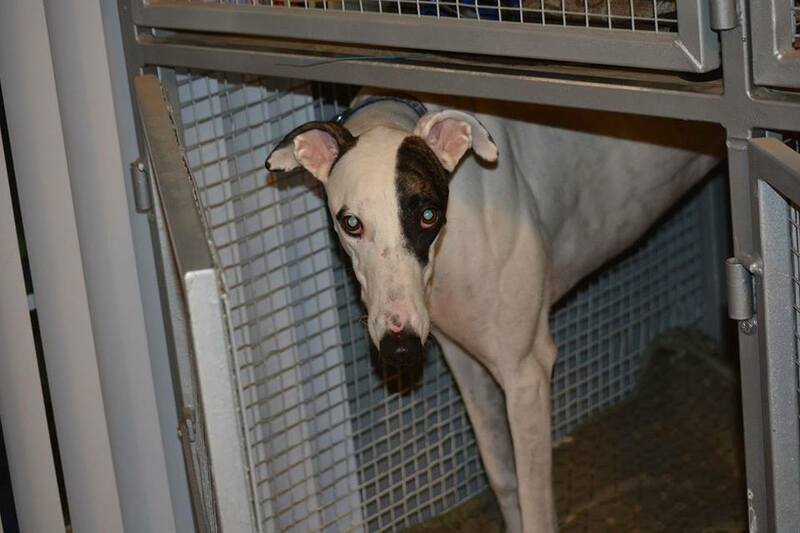 In a greyhound racing kennel all the dogs wake up and get up when someone comes in or opens their crate so sleep startle is rarely ever seen and definitely isn't a problem. Since she arrived we have found that she doesn't like to be touched when she is sleeping. For this reason we prefer to place her in a home without kids or a home with older kids that are old enough to understand not to bother her while she is sleeping. Her foster home has been working on this behavior and Patsy is responding well to training. Patsy has lived with a small hyper dog but would do better with larger, calmer dogs that will not jump on her when she is sleeping for the same reason. She has lived with cats and is good with them. She gives kisses and loves to play with toys. A very happy, friendly girl and what a GORGEOUS girl! She is very sweet and well behaved and has great house manners. Spellbound is a tall red fawn female. She raced at 66lbs. She just arrived from the Birmingham Race Track. She only ran 12 races and is another one that started bumping into and playing with the other racers so was not allowed to continue her racing career. Her sire is BD's Greyson and her dam is WW's Uh Huh. She turned 2 on Nov 6th. Spellbound was too interested in kitties to pass her cat test so we thought she would need a home with no cats but she paid no attention to that cats in later cat tests so seems to be OK now. She did well with small dogs as well. More as we get to know her. Irena just arrived from the Sanford Orlando Race track. She was brought in specifically for one our families that met her at the track and has been waiting to adopt her. She raced 128 races and got up to the top A level at Sanford Orlando. She started out her career at Southland in Arkansas and also raced at Flagler and Derby Lane briefly before being moved to Sanford Orlando. 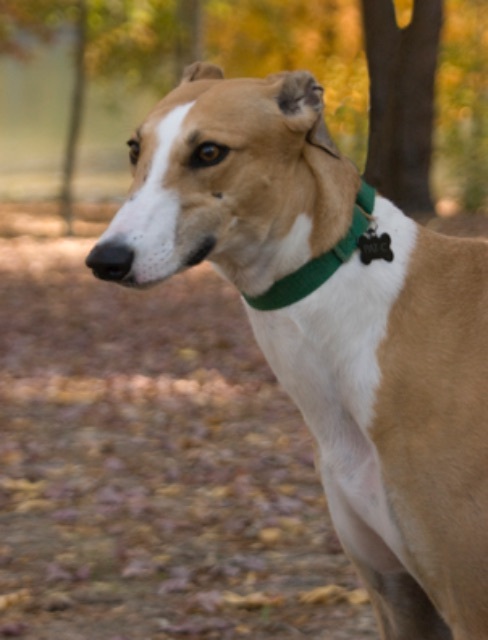 Irena raced at 60lbs and her sire is the very famous Kiowa Sweet Trey. Her dam is USA Lila. Irena's last race was September 14th of 2014. 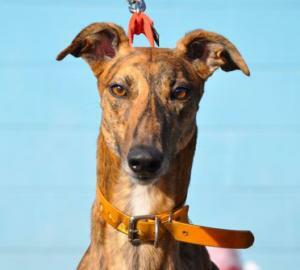 While she was racing, her trainer took her over to the local highschool to be a mascot for the Lyman Greyhounds. She loved all the attention and her naturally confident, happy personality made her perfect for her other job. Be sure to look at her other pictures to see pictures of her as a mascot. She is good with small dogs and loves kids. 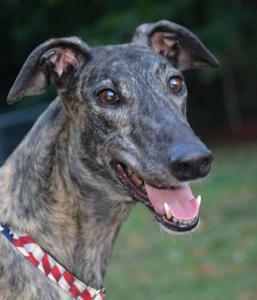 Mac is an extra large, loving greyhound that raced at a huge 84lbs and is well over 90lbs now. 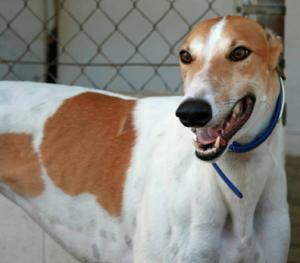 During his time at Orange Park track adoption kennel (GPA of NE Florida) he was a kennel favorite. His sire is the famous Kiowa Sweet Trey so he is a half brother to a bunch of the dogs we have placed. His dad seems to throw extra sweet pups and Mac is a twin to another big guy that we already placed. He was born on March 21st of 2009 so he is 4 years old. This boy is a happy, loving guy that loves everyone he meets. He seems like a fun guy that bounces happily when he meets you but so far has crated quietly so can be calm and lazy too. He is food motivated so should be easy to train to do tricks or obedience. Mac is a big lovable guy that is going to make a great pet. He is cat and small dog friendly so could live with either. Mac has been in an adoptive home for over a year now and was returned to us because they had a child and no longer had time for a dog. He is wonderful with kids and should be an easy pre acclimated pet for some lucky family. He was returned to us very overweight so we are working on getting some weight off of him. The photos we have of him are ones when he first retired and was in great shape. Dempsey is arriving from the Birmingham Race Track. 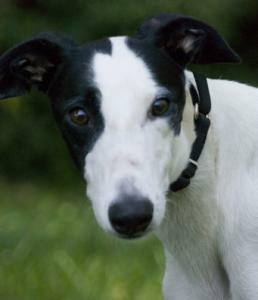 He is a white male with black spots that raced at 69lbs so is on the smaller side for a male. He only raced 2 races, one in Daytona and one in Birmingham. He tried to play with the other racers in both races which is not allowed. It meant he had to be retired. He is young and turned 2 on August 7th. His sire is Kiowa Mon Manny and his Dam is Kiowa Deli Dana. He did not pass his cat test at the track so will need a home with no kitties. He was OK with the small dog he met at the track and should be OK to live with small dogs with supervision at first. He is a quiet guy that should be OK to live in an apartment. 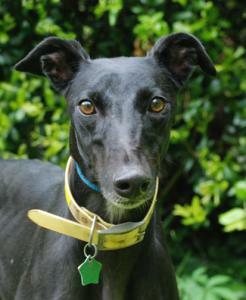 Salsa is a cute little black female that is arriving from the Birmingham Race Track. She didn't show much promise as a racer and never even raced an official race there. She turned 2 on March 21st. Her sire is CTW Plaza Rio and her Dam is CTW Pole Dancer. She did pass her cat and small dog tests at the track and is being fostered in a home with cats. She is a sweet, friendly girl that her foster home says is a joy to have as a guest. 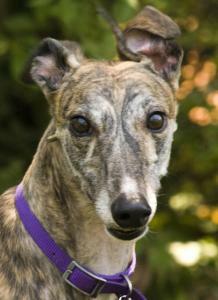 Bambi is a cute little brindle female that raced at just 56lbs. Her sire is San Tan Savage and her dam is Deco Brandi Jett which is a dog that belongs to one of our volunteers. Bambi is a friendly happy girl that turned 2 on September 5th. She only raced two races at the Birmingham Race Track and finished last in both of them so was retired. She passed her cat and small dog tests so should be fine to live with either. She is a sweet friendly girl! More as we get to know her. Mike is arriving from the Birmingham Race Track where he raced 134 races. He was a good racer competing at the top A level for much of his career and until he retired. 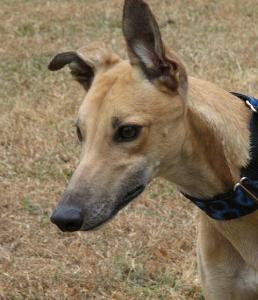 Mike is a small male that raced at just 64lbs. He passed his small dog test at the track and seemed to be a little interested but trainable with the cat. Mike loves the kids that have visited him at the track adoption kennel and seems like he would be wonderful for a family with kids. He turned 3 on June 14th. His sire is Rhythmless and his dam is Gable Nip. He is a happy, friendly guy with a great personality. More as we get to know him. True is a pretty black female that raced at 69lbs. She only raced 18 races at Wheelng Downs in WV and Orange Park in FL and didn't win one of them and only placed in 2 of them. Her sire is the famous Trent Lee and her dam is Kay Carmella. True is a very calm, quiet girl that was well behaved on the trip up and is excellent on leash. She will turn 3 on April 15th. True passed her cat test at the track so can live in a home with them and should be fine to live with small dogs. She was fine with the kids she met too. She loves going for walks with her foster dad. She potties well on leash and is quiet in her crate. Draw just arrived from Orange Park track in Jacksonville Florida. 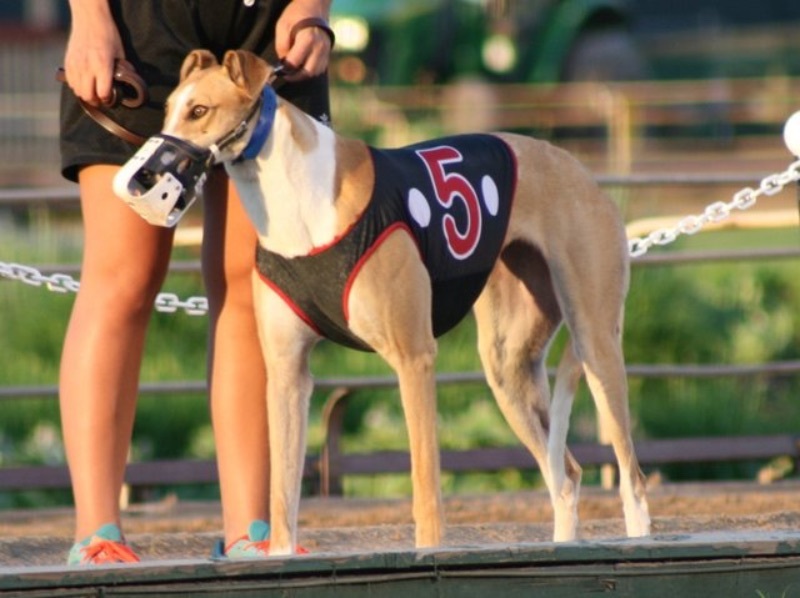 He was a very good racer winning top A level races at Derby Lane, Sarasota and Orange Park and even competing in some Stakes Races. He raced 173 races and retired a year ago in June. He has been at the track waiting on a home since then. Draw's sire is Brady Thomas and his dam is M's Mary Freeman. He is 5 years old and will turn 6 on December 20th. He is a happy bouncy boy that is silly and friendly. He passed his cat test so should be fine to live with cats or small dogs. 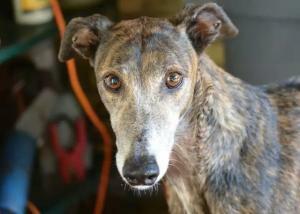 Draw loves to run and is an active guy for a 5 year old so would do best in a home with a fenced yard. Since he is bouncy and goofy we also marked him older children only. He likes kids and would accidentally knock over a toddler in his enthusiasm to play. It is just because of his playfulness and bounciness though and we don't believe he would ever intentionally hurt anything. Brandi just arrived from a farm in Kansas. She was a brood mom and had 36 babies before she was retired. Brandi will be 9 on November 17th 2005. Her sire is Kiowa Sweet Trey and her dam is Flying Monaco. She is a sister to the famous Flying Hydrogen and will be living with her brother permanently. Brandi is a sweet girl that smiles and has a wonderful personality. She has no races listed. 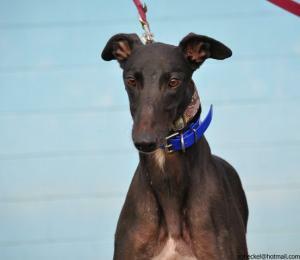 Kiska was a good racer that raced 172 races at Derby Lane in St Pete Florida. She retired from racing in February of 2010 and began her second career as a mom. She had 2 litters since and raised 11 pups. Kiska has now been retired from that career and is ready to be a pet. She just turned 8 years old on June 16th. Her sire is the famous Gable Dodge and her dam is Flying AC DC. She passed her cat and small dog tests so should be fine to live with either. Kiska has done great in her foster home. She is very confident and doesn't let anything bother her. She gets along great with all the other dogs in her foster home large and small. Kiska walks great on leash and loves to go for walks. She loves to play with squeaky toys even more. She is a very sweet girl that will come up and lean against you for affection. 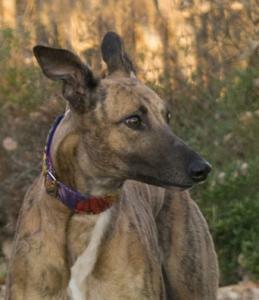 It doesn't show so much in her photos but she is a beautiful light fawn with dark sable tips. She is good with children that treat dogs respectfully but she did take offense to a child that crawled on her and laid on her. So she needs to be placed with children old enough to be taught that you should never lay on or crawl on dogs because it hurts them. 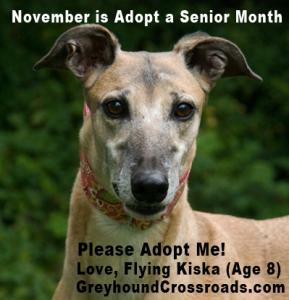 Because Kiska is over 8 years old she qualifies for a discounted adoption fee of $200. 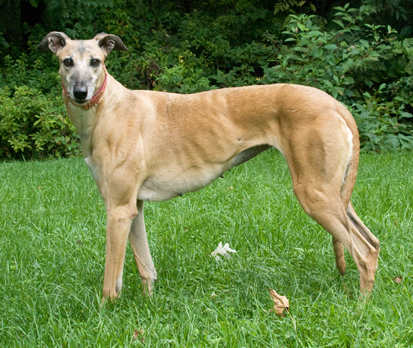 Ginger raced at Orange Park in Jacksonville and then in Orlando. She ran 43 raced before she broke her leg. She is a member of our injured athlete program that takes in injured dogs, gets them vet care and rehabs the dogs until they are cleared for adoption. Ginger has had surgery and is in a splint now. She is expected to make a full recovery and should be ready for adoption sometime in October. Her sire is Gable Sour Cream and her dam is AMF Setting Sun. She turned 2 on April 22nd. Ginger is good with the small dog in her foster home so should be fine to live with small dogs. She is very calm and laid back for a young girl. She is a little timid at first and took a couple of weeks to get comfortable in her foster home. She likes her crate and chooses to stay there where she is comfortable even with the door open sometimes. Spitfire just arrived from the Birmingham Race Track. She only raced 12 races and didn't win any of them and only placed in 2 of those. Her sire is Dragon Fire and her dam is Cry Huron. Spitfire has had mixed results with cats, showing no interest in some but extreme interest in others so she needs a home with no kitties. She is a pretty white girl with just a few black spots. She just celebrated her 2nd birthday on October 13th. Spitfire travels well and just lays down or rides with her head on your shoulder. She is quiet in her crate and potties nicely on leash so may be a good apartment dog. She did great with the child in her foster home. Spitfire is on the timid and submissive side. She was pretty overwhelmed when she first arrived and didn't eat for a couple of days but now has come out of her shell and wags and approaches people and is very loving. She gets along very well with other dogs too. 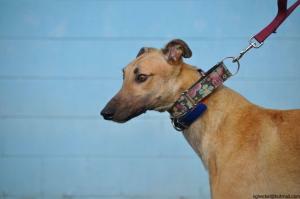 Lucy is a sweet, friendly, waggy girl that loves everyone she meets. 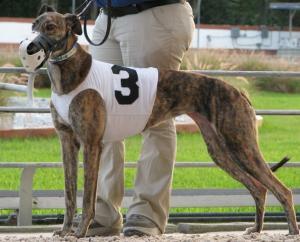 This is a tiny little girl that raced at just 53lbs at Orange Park in Jacksonville FL. She has a lot of personality in that small frame though. Lucy passed her cat and small dogs tests so should be fine living with either. She just turned 4 on October 2nd. Her sire is the famous Lonesome Cry and her dam is Top Cat Olympia. She has been a little loud when left in her crate so we don't think Image will be able to live in an apartment or townhouse. Lucy has been in a wonderful adoptive home for over a year. Her owner's health is declining and she is no longer able to care for her dogs. She has made the tough decision to rehome her dogs Lucy and Angel. Lucy is already home acclimated and is well behaved. She has lived with kids and other dogs and gets along great with everyone. 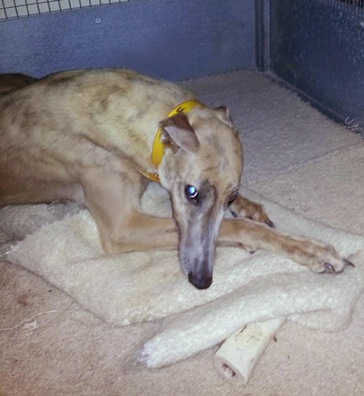 Sahara just arrived from the Orange Park Track in Jacksonville Fl. She raced 126 races at 66lbs. She raced at Dubuque IA and in Sarasota FL too. Sahara turned 4 on July 14th. Her sire is Kelso's Fusileer and her dam is Pat C Output. 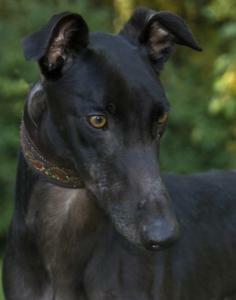 She is a beautiful dark red girl that is calm, friendly and well behaved. She has been around kids and loves all 4 of her trainers kids and was around them daily. The youngest child was 1 year old. More as we get to know her. Sahara seems to be cat trainable. She was interested in the cat at first, until the cat smacked her, then she was afraid of the cat. 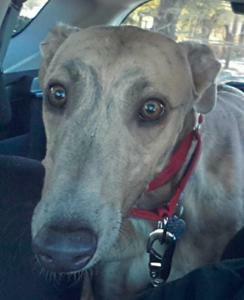 Dalma came from the Jacksonville Fl race track. She raced 132 races at 62lbs. 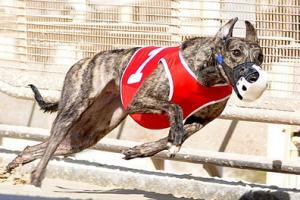 She raced most of her races at Orange Park but also raced at Derby Lane. She is a pretty black girl that celebrated her 4th birthday on Feb 1st. Her sire is Daddy Warbarks and her dam is Zoomn Cheri. Dalma's last race was in January. 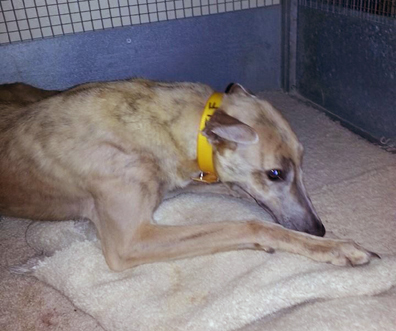 She had a couple of seizures at the track and her owner decided it was best to retired her. She was at the track kennel from January until May waiting on a group that could take her and didn't have any more seizures even without medication to prevent them. The stress of the move from the track triggered another seizure so we put her on medication to prevent more and she has had no seizures since she started the medication. The medication is inexpensive and she may not even need to be on medication once she is in a permanent home since high excitement and stress seem to trigger her seizures. 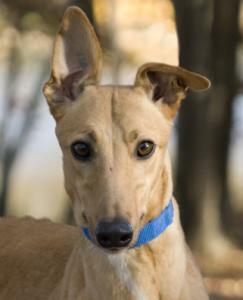 Dalma is a sweet, happy girl that is very very loving. She will curl up in your lap and loves to snuggle with people. 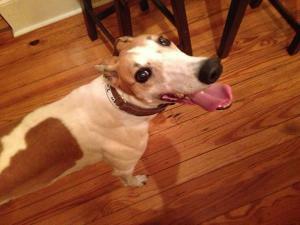 She is very friendly with people and gets along great with the other dogs in her foster home. Her current foster home would love to dog sit for her after adoption if she is adopted in the area. Dalma did pass her cat and small dog tests so should be fine to live with either. She likes the small children in her foster home. Dalma does potty nicely on leash now so may be OK for apartment living. Khloe just arrived. She raced 67 races at Southland in Arkansas and retired in August of 2012. She was sent to a farm to be a mom and now is officially retired from that as well and is looking for a home. Khloe is a beautiful brindle girl that turned 5 on February 3rd. She is the daughter of the very famous Flying Hydrogen that her foster dad owns. Her dam is Molly. She is big for a girl at 73lbs. Very sweet and friendly. More as we get to know her. 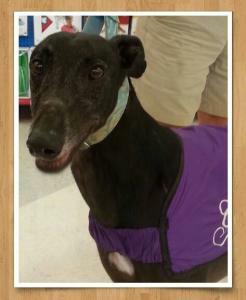 Star is a 77lb black male that just retired from the Sanford Orlando Race track. He was pretty good and quickly got up to A level. He turned 2 on May 28th so is still a young guy. Star loves people and is very friendly. Star's sire is the famous Iruska All Star and his dam is WW Star Isabel. Star did not pass his cat test so needs a home without cats. He loves to play and can play a little too rough for very small dogs. 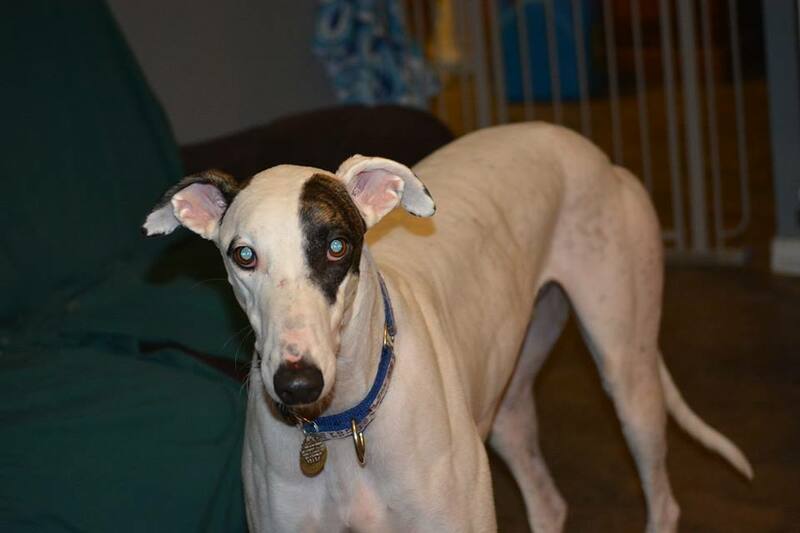 Although he is good most of the time with the Italian greyhound in his foster home he would probably do better with a medium or larger sized dog that he could actually play with. Star loves kids and chooses to follow them around. He isn't fond of his crate and does complain about it a bit so would not be a good choice for an apartment. Star does sleep through the night in the crate though and seems to only make noise when people are around and he is hoping to be let out or at dinner time. When he thinks no one is home, he is quiet. Star seems to be a pretty calm guy but still likes to play and get silly. Star is pretty smart and did figure out how to unhook the standard folding metal crates and get out of them. He will need a plastic vari kennel in his new home. 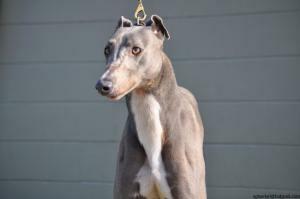 Ditto is a rare blue male that raced 77 races at Orange Park in Jacksonville FL. He also raced in Sarasota and at Southland in Arkansas. Ditto raced at 75lbs. His sire is Kelsos Fusileer and his dam is Whytell Broom. Ditto turned 3 on April 1st. He is a very very calm laid back guy. Likes love but is mellow and content to do whatever. Very smart will walk over and get on the scale if you tell him to and stand there until you tell him to get down. He is probably cat safe based on his reactions. His foster home is planning to adopt Ditto if he gets along with the other dogs there. 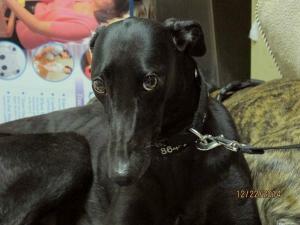 Blackie just arrived from the Orange Park Track in Jacksonville FL. He is a handsome, shiny black boy that is a mid sized guy at 72lbs. He doesn't have any races listed and just turned 2 on April 24th so is a young guy. His sire is Yahoo Omar and his dam is O Ya Cranberry. He was at the track adoption kennel for awhile before we got him and they said he is a calm, well behaved guy. He travels well and just laid down on his trip up from Florida. He also passed his cat and small dog test so should be fine living in a home with either. 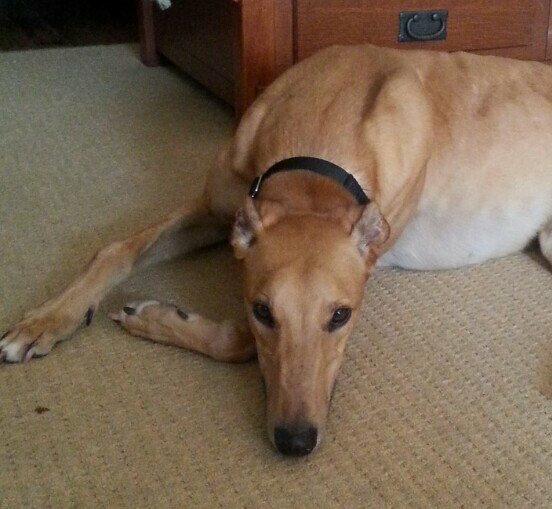 He has settled into home life easily and is quiet in his crate, calm and well behaved. He is very sweet, loves people and gives kisses. He has been good with the kids he has met. His foster home says he is smart and learns fast. He walks nicely on leash and loves to go for walks. From his description he sounds like he is a nearly perfect guy! Bob originally raced 58 races at the now closed Raynham/Taunton track in Mass. He raced at 74lbs. His Sire is the very famous Oshkosh Slammer and his dam is Prima Superior. We placed him originally in April of 2007 and he has been in his adoptive home since then. He was returned to us at 11 years old because he had bad breath and some loose stools. We have given him a much needed dental and removed all but 7 teeth. He is on meds for the diarrhea and our vet did a physical on him. All test results came back good and he seems like he is a healthy guy other than having some arthritis. He still bounces happily and likes to play. He is a happy friendly guy with a great personality that is good with cats, small dogs and kids. His foster home says he is nearly perfect. Because Bob is over 8 years old he qualifies for our reduced adoption fee of of $200. Lori is just arriving from a greyhound farm. She hasn't showed much interest in racing so her racing owner thinks she should be a pet instead of being sent to the track. Lori's sister Lindy is arriving with her for the same reason. Lori is a cute white girl with black spots. She passed her cat and small dog tests without interest in chasing either. Lori is the more confident outgoing one of the two sisters. Her sire is DJ's Octane and her dam is Leprechaun Girl. Neither of these girls were registered to race so have no racing name or racing weight. More as we get to know them. Tina Turner is a white girl with brindle spots. She just arrived from the Birmingham AL race track but has no races listed so evidentally didn't do well in race training. Her sire is the very famous Kiowa Sweet Trey and her dam is WW's Robson. She is a young girl that just turned 1 on April 7th. She did pass her cat test so would be fine to live with cats and small dogs. She is a happy pup that is silly. Tina Turner is a natural sitter and will plop into a sit position often. She seems like she is still in the submissive puppy stage and doesn't have a lot of confidence yet. She is a talker and has quiet the vocabulary of sounds she makes. She travels very well. Tina Turner was a little overwhelmed by all the changes when she arrived but seems like she is going to be a friendly happy silly pup. Since she is still a puppy she will need a large fenced yard to run around in. Greyhound puppies are not typically the calm dogs that adult greyhounds are and need to run and play every day to burn off some of that energy. JD just arrived from the Sanford Orlando Race track. He raced 85 races there and in Dubuque IA. He wasn't a good racer and only won 4 races in his entire career. His race weight is 75lbs so he is a mid sized guy. His sire is Surf Lorian and his dam is JD Delusion. 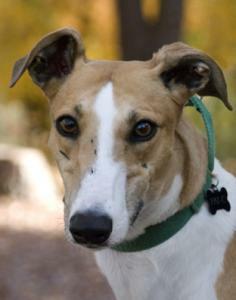 He will turn 3 on October 15th and hopes to celebrate his birthday with his new family. He is a very, happy, outgoing guy that loves people and loves attention. He is a more active guy that pulls some on the leash excited to see everything around him. He also gives hugs which we are working on correcting. He has been really good in his foster home so far and is quiet in his crate. Seems like a great guy and is very very cute. JD was adopted by the Tucker family in 2014 and renamed Oscar. He lived a happy life until he suddenly became paralyzed not long after his 5th birthday in 2016. His vet and specialists were unable to find the cause of the mystery illness and he passed away in November of 2016. SIster Sledge just arrived from the Birmingham Race Track in AL. She is a pretty white girl with black speckles that give her a bit of a dalmation look. She raced at 57lbs so is a smaller girl. Her sire is Kiowa WW Brother and her dam is Greys Hard Copy. Sister Sledge was a good racer at the top A level at Birmingham and raced most of her 72 races there. She also raced at Orange Park and Daytona Beach in Florida. Sister Sledge did pass her cat test so should be fine living in a home with cats or small dogs. She turned two on February 25th. 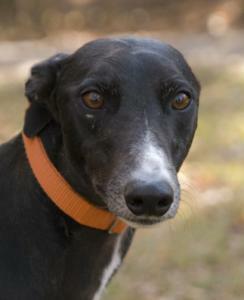 Sister Sledge is a sweet friendly girl that is happy and waggy. She needs a little work on walking nicely on leash because she is so excited to see everything on walks. She seems like a higher energy gal. Sister Sledge travels well and doesn't seemed to be bothered by much. 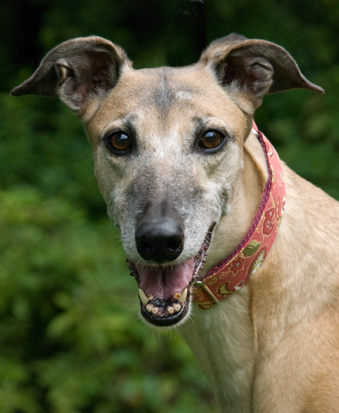 She is a greyhound that will grin at you when she is happy. Thunder is a brindle boy that raced at 78lbs. He raced at several tracks starting out at Tri State in WV, then going to Palm Beach, Melbourne and Sanford Orlando in Florida. He raced 136 races. His sire is Iruska All Star and his dam is ICU Flight Plan. Thunder is a sweet, very friendly boy that loves people. He is very calm and well behaved. Thunder turned 4 on May 17th. Thunder seemed to be very interested in the cats when he arrived at the vet's office so even though he hasn't had an official cat test, it looks like he will need a home with no kitties. He is a friendly happy guy so far. He has done fine with the small dog he met and just sniffed him politely. Thunder has been doing great in his foster home and is a very nice guy. 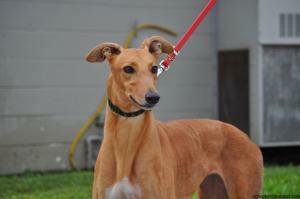 Cash is a pretty red male that just arrived from the Orange Park Track in Jacksonville. He has no races listed and is a very young guy that won't turn 2 until February 10th. Because he ran no races he has no racing weight listed but we guess him to be between 75 and 80lbs. Cash's sire is D's Klinger and his dam is D's Belle. He is a very friendly guy that wants to be with people. Loves his ear scritches and will stand by you hoping to get a few. He rode nicely on the trip up from the track and laid down with his head between the front seats so that he was within reach of the people so they could pet him. He was cat trainable when they did his cat test at the track. He was curious about the cat but corrected easily. More as we get to know him. Panda just arrived from the Sanford Orlando race track. She just turned 3 on September 28th and got her name because her coloring reminded her trainer of a panda. She raced 83 races and got up to A level. Panda raced at 61lbs. Her sire is Lonesome Cry and her dam is McCain. 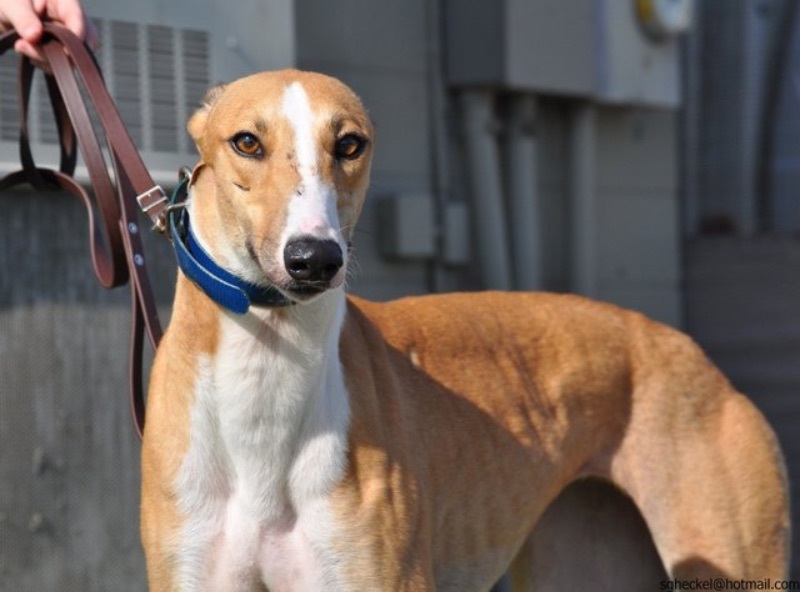 She was pretty shy when she first arrived at the racing kennel but warmed up after she had been there for awhile. She is doing great in foster care and seems like she gained a lot of confidence during her race career because she wasn't stressed by the trip or by being around new people. 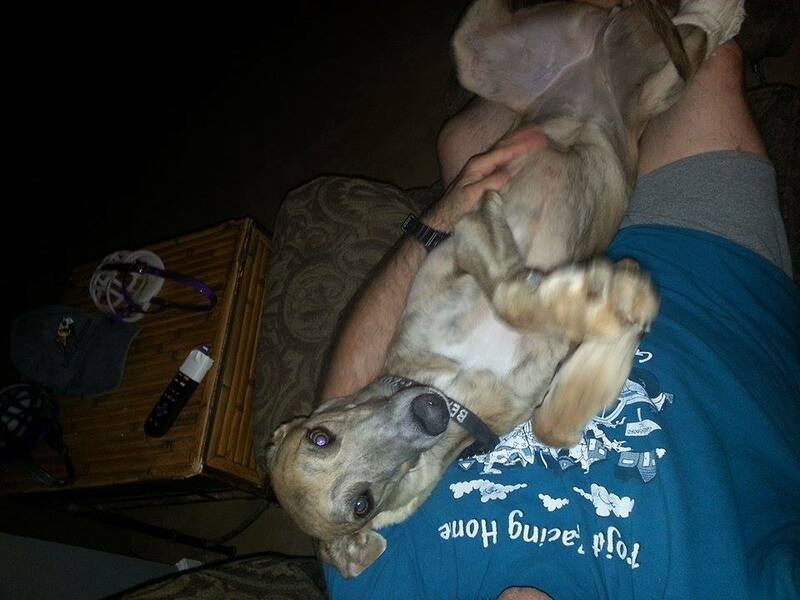 She has taken everything in stride and her foster home says she is absolutely fantastic. She hasn't even had an accident. She has been good with the small dogs she has met and was playing with toys the first day. She is quiet in her crate as long as she can't see you but if she knows someone is home she asks to be let out. She has been good so far with her foster family's kids too. Rotation just arrived from the Orange Park Race Track in Jacksonville FL where he raced 133 races. He was a good racer and got up to A level and even competed in some big Stakes races. Rotation's sire is Ronco and his dam is Starz Magma. He will celebrate his 4th birthday on August 3rd. Rotation passed his small dog and cat tests easily. He is a friendly, waggy boy that seems like he is a mid level energy guy. 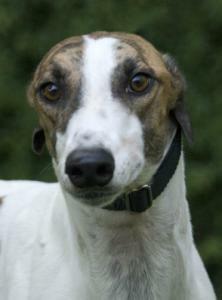 He is very well-behaved in his foster home and is getting along with the male and female greyhounds there really well. He is a sweet boy. Tessie is the daughter of one of our volunteers personal dogs so we have been waiting for her to retire. She raced 125 races and has been at quite a few tracks, Naples-Ft. Myers, Flagler, Palm Beach and Sanford Orlando. She wasn't a great racer and in all that time only won 10 races. She raced at 62lbs so is a mid sized girl. Her sire is Loxahatchee Dash and her Dam is Deco Brandi Jett. She has a great personality like her mom and they both give big grins when happy. Both are extremely happy, social dogs and do great with other dogs and especially love people. So far everyone that has met Tessie say she is a doll. Very social and very sweet. Oscar is a friendly, bouncy, red brindle guy that will celebrate his 4th birthday October 7th. His sire is KJ''s Yukon Gold and his Dam is Gilded Rose. He has 47 races to his credit and he raced at Bluffs Run, Sarasota and Sanford Orlando. He only won 2 races but placed in the money a lot. He raced at 73lbs. He is a sweet guy that passed his cat test and has been living in a home with them. At the track they said that he was Mr Personality following his trainers around and interacting with them a lot while they were doing chores. We have seen the same thing. He doesn't seem to meet a stranger and is very outgoing and friendly. He travelled well on the trip up from the track. 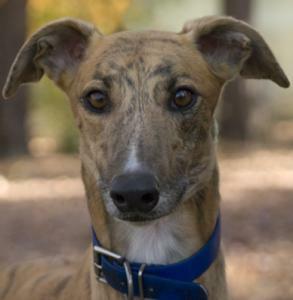 He is a higher energy greyhound that loves to run laps every day so would do best in a home with a large yard to run in and maybe even another dog to play with. He probably wouldn't do well in an apartment without a place to run. Oscar has been living in an adoptive home for a year but they felt he would be happier in a home with a large yard, another dog or kids to play with. Because of his higher energy level he might be the perfect dog for someone that wanted a greyhound that could do agility or lure coursing. Oscar absolutely loves children and would be great in a home with older kids that he could play with. This boy is all about playing and having a good time. Update on Oscar from his foster mom: Oscar is the happiest doggie ever. He will wake you in the morning by putting his nose in your face. If that doesn't work, he'll slip his nose under the covers. And if that doesn't work, he will softly bark you a good morning. He thinks eating is the most wonderful thing ever! He thinks walking is the most wonderful thing ever but isn't big on going jogging and will stop after less than a mile! He thinks sleeping is the most wonderful thing ever! But maybe the MOST wonderful thing ever is when you come home and he is so happy and waggy. Not terribly friendly to squirrels, but all other critters are friends. Totally house trained. Stinger is a huge, gorgeous, white and brindle male that raced a couple of races in Abilene and was moved to Sanford Orlando where he retired from in October of last year. He is an extra large male that raced at 94lbs and has 29 races to his credit. His sire is TNT Star Wars and his dam is Super C Queen. He celebrated his 2nd birthday on May 10th. He has been in 2 homes since October of last year. He was returned to us the first time because his family was expecting twins. They didn't feel he will be good with young children because he startles easily when asleep. He did live with a 10 year old boy though and loved him. He is a friendly. happy guy that likes people and is very well mannered in a home. He is good with small dogs but is not good with cats so needs a home with no cats. Stinger was adopted by a second family that didn't have a fenced yard. They found that he really prefers his privacy and likes to find that perfect spot to do his business which didn't work out well on leash and let to long unproductive walks and a few accidents. Stinger was also pretty excited and distracted by the rabbits and small critters wandering in the area he was supposed to go potty in which contributed to the problem. 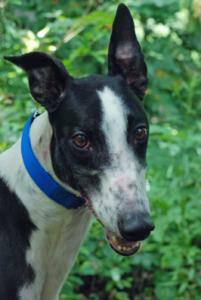 So Stinger is looking for another home with a fenced yard where he can be comfortable. 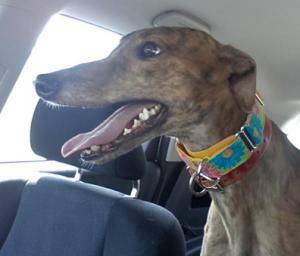 Thelma came in from GPA Central Florida adoption group at the Melbourne Florida Race Track. 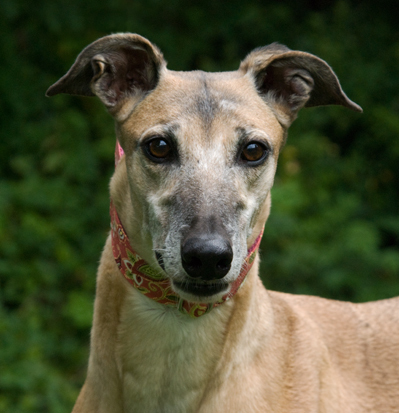 She never raced and had been in a home with her sister Louise (Jedi Eile) for awhile. The family returned both girls to the adoption kennel recently. Thelma was transported up to our group at that point. She turns 3 on April 30th and weighs 49lbs. She is a cute friendly brindle girl. Her sire is Swahili Eile and her dam is Flying Bridgely. Thelma is living with cats and small dogs and is good with both. She was a special request for one of our volunteers so isn't available for adoption. Starr just arrived from a farm in Kansas. 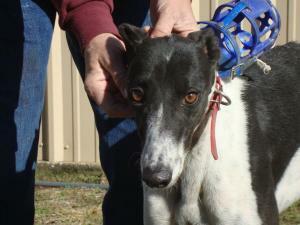 She retired from racing in 2012 and had been on the farm since then with plans to have her be a mom. When her owner heard that she had a family interested in adopting her, he decided not to breed her and send her to us instead. Starr is a littermate to several dogs we have placed already and she is being adopted by one of the families that already has her sister. 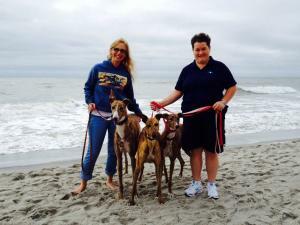 Star arrived at our big dog event Beach Bound Hounds and was fostered in a hotel room. She is a very outgoing, confident girl and took all the people and dogs at the event in stride. She is not afraid of anything and even did scary open stairs the first time she saw them and had no problem on the elevator in the hotel either. She loved the ocean and wasn't afraid of the waves. She does have a pretty high prey drive and was very interested in little dogs she saw, so probably wouldn't be able to live with cats or small dogs but hasn't been officially tested. Starr is a couch dog and the first thing she did was jump up on the couch and make herself comfortable. She loves to lay in your lap too and snuggle. She is not a small girl at 70lbs but don't tell her she is too big to be a lap dog. Her sire is Balligari and her dam is Elysium. She raced 41 races at Wheeling Downs, Derby Lane and Palm Beach. She will turn 5 on December 1st. She is the one in the middle in this picture of her with her brother and sister.